This is why I started collecting. 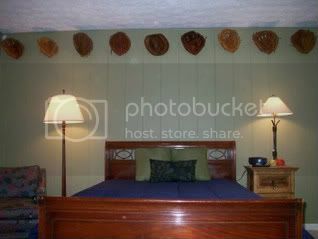 My son's room now has endorsed gloves of the "great eight" + Don Gullett. They're finally together in one of their 8 different batting orders: Rose, Morgan, Griffey, Perez, Bench, Foster, Concepcion, Geronimo, and Gullet. Of course, they're all RHT so we can use them. From a like-minded fan of The Big Red Machine, that display is awesome! I've put together pretty much the same collection. Actually, you have me beat in completing the full line-up- I still do not have a Griffey (senior). Saw a couple on eBay over the years, but haven't managed to snag one...yet. Yours are displayed much more nicely than mine. I did have mine on a shelf over the entertainment stand in my family room for awhile. That display gets changed around fairly often, depending on which gloves I'm working on or restoring at the time. 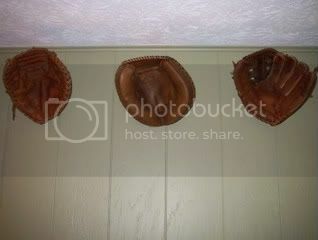 Right now, my family room display is pretty much older stuff- split-finger and buckle-back gloves. It seems that the wife gets antsy when my display grows bigger than twenty or so gloves, so the other couple of hundred are packed away at the moment! The one glove that sits on my computer stand is a Reds tribute- a MacGregor G65R Pete Rose personal model in nearly new condition, made entirely from bright red leather with all gold stampings. She's a beauty! Another I have that's hard to come by is the MacGregor PROM (Pro Model) that features not one, not two, but three Reds endorsements on one glove! Running up the middle, third and pinky finger are the stamped signatures of Joe Morgan, Pete Rose and George Foster. Very unusual glove and a hard-to-find Big Red Machine collectible. I've also kept my eye open for upgrades over the years. 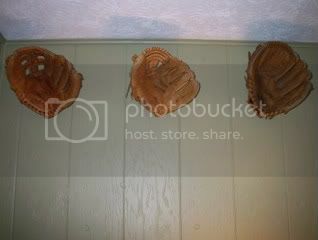 For instance, I must have had three or four different lower-quality Johnny Bench catcher's mitts before I finally got my hands on a nice top-line Heart of the Hide model. 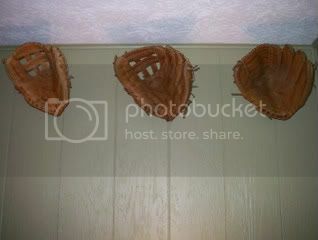 I'm still watching for the elusive Rawlings R4000 Davey Concepcion fielder's glove. That was a higher-quality glove only made for three years from 1977 to 1979. Of course, there are plenty of gloves endorsed by other Reds greats to be found- Frank Robinson, Ernie Lombardi, Ted Kluszewski, Wally Post, Johnny Temple, Johnny Vander Meer and even "the old left-hander" Joe Nuxhall, to name just a few. Too bad there were never any Danny Driessen, Ed Armbrister, Bill Plumber, Jack Billingham or Pedro Borbon gloves made- we could round out our bench and fill in our pitching staff! Great idea with great results! I'm sure your son loves it! My favorite on that team....Tony Perez. All the kids on my block had his stance down-pat. The Big Red Machine......what a team. I have a bunch of them as well -- still missing Griffey, Foster and I haven't got a pitcher. Like to have Billingham, but I don't think there is such a thing. I have quite a few Reds from other eras as well. Last edited by robin_buckeye on January 20th, 2009, 8:40 pm, edited 1 time in total. I think I had all but Geronimo at one time. Will you put what brands down for each player glove? There are some neat glove stories on the Morgan, Concepcion, Bench and Perez gloves. Rose, Morgan, Perez and Foster are all McGregors. I know Regent also had a Foster. Griff, Bench, Concep, Geronimo, and Gullett are Rawlings. Unfortunately from that era they are all imports, except the Bench. At least the Rose, Foster, Geronimo, and Gullett have leather bindings - I can't stand the old (and usually cracked) vinyl. Of the group, Cesar's is my favorite: it's a huge "softball size", all leather wing-tip. My brother also has a Lee May 1st Base mitt that our Father gave him. Not sure who made it. A couple of these gloves are LHT which is great since I have an LHT son!